If there is one distinctive most folks know, it is Cincinnati-Style Chili. 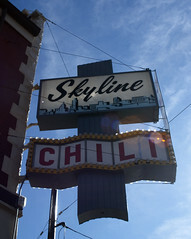 EVERY Monday Night Football game has to have a shot of the riverfront, and a chili parlor, usually Skyline. If I have the opportunity to introduce someone to Cincinnati Chili my first suggestion is to not think of it as Chili. Think of it as a meat sauce. 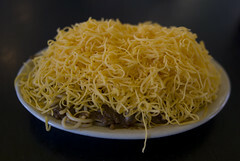 The original Cincinnati Chili was Empress, and arguably the most popular is Skyline. Both were founded by Greek immigrants, so you could even think of it as a Greek meat sauce. Cincinnati Chili is served over spaghetti with a mound of cheddar cheese, or as a coney on a small hot dog, also smothered in Cheese. You can order a bowl, but that is not a very satisfying way to eat it. The classic way to eat Cincinnati Chili is over spaghetti. You can choose 3-way, 4-way, or 5-way. The 3 “ways” are Chili, spaghetti, and cheese (a mild cheddar). The 4th way can be onion, or beans. The 5th way is onion and beans. Some other parlors can add a 6th way. Dixie adds minced garlic, and Blue Ash Chili adds fried jalapeno caps that I believe they added to the menu for DDD. The other classic choice is the coney. Basically substitute a small hot dog and bun for the spaghetti. It usually also comes with mustard and onion. Not a bad way to give it a shot the first time. There are lots of parlors in town (and parlor is the correct term). Skyline is my favorite, and is a large chain. Another large chain is Gold Star which I am not a fan of. Between these extremes are a number of choices. Neighborhood parlors like , Blue Ash Chili, Camp Washington Chili, and Price Hill Chili. I find Camp Washington Chili to be the most distinctive. I like it, but it is not my favorite. Dixie Chili is a Kentucky chain. I’m embarrassed to say I have not tried it. I really need to. It has its fans. If you want the original, you’ll have to track down an Empress Chili. There are not many left. I tried the one in Mt. Lookout before it closed. Not as good as Skyline in my opinion, but of course far superior to Gold Star. If you are visiting for the All-Star game, there is a Skyline at the corner of Fourth and Sycamore that is not far from the ball park. You can also get it at the ball park. Montgomery Inn Ribs has been around for a long time. Their ribs are wonderfully tender, and the sauce is addictive. Many BBQ Ribs fans will turn their noses up to these, say they aren’t BBQ ribs. Well, they are not. They are fall off the bone tender, and the sauce is terrific. My understanding is that fall off the bone is a cardinal sin for BBQ ribs. I’m OK with that. I think they have stepped up their ribs in recent years. They seem better seasoned and flavorful than in the past now that BBQ ribs have become more available in the area. So competition is good. The Boat House is on the river just East of the stadium. I recommend the saratoga chips so that you can eat more of the sauce. If your tastes run more towards authentic barbecue, there are other options. These include Eli’s Barbecue further East and Pontiac Bourbon and Barbecue in OTR that serves Memphis-style. Cincinnati has some great Ice Cream options. My favorite one is Graeter’s. As myself, and some co-workers, were wont to say “How could we make this meal Graeter?” It is French pot ice cream, meaning very thick and creamy, not a lot of air. You have to try a chip flavor. The chips are made by pouring warm chocolate into the ice cream and breaking it up with paddles. If you hit Montgomery Inn, you can get Graeter’s for desert. There is also a Graeter’s on Fountain Square. Others will point to Aglamesis as the choice. I prefer Graeter’s, but this is not like Gold Star, Aglamesis is some mighty fine ice cream. If you want to cross the bridge and check out Bellevue, KY, you might also want to give Schneider’s Sweet Shop a go. Their claim to fame is the ice ball with ice cream. It is a scoop of their own ice cream surrounded by shaved ice with a flavor added. My personal favorite is Chocolate ice cream with cherry ice. Think cherry Tootsie pop. Don’t under rate their ice cream though. I reviewed them back in 2008. OK, if anything might cause locals to comment, this could be it. However, I also have to recommend LaRosa’s as a distinctive Cincinnati choice. I was raised on it, and like it. The sauce is a bit too sweet for some, and they use provolone instead of mozzarella, but I like it. This is another Cincinnati food you can try at the ball park. They also serve other American-Italian dishes and hoagies. There are a number of other places I could point you to for pizza, but this would be the most Cincinnati choice. You can see my post Best is a Bad Word, Even When Applied to Pizza to see other options. This could have easily gone into my next post, but I think it has been around long enough to belong here. If you have not spent enough money on your trip to the All-Star game, you can spend it at The Precinct. There are actually a number of steak houses in this group, and Jeff Ruby’s is on Vine and 7th, but there is something about the Precinct. They serve dry-aged steak, and use a wonderful seasoning that is very tasty without being overpowering. In fact, they now sell the seasoning at the restaurant. It is great in hamburgers. Have your own ideas on Cincinnati Classics? Chime in on the comments below. I tell people the same thing about Skyline… Greek meat sauce, and you’ll have a more open mind when you try it. But, while Montgomery Inn ribs are definitely Cincy, I can’t put them on any ‘best’ list. Fair enough Curt. Although you may notice I did not put them on any best list either, I don’t do best. Definitely a favorite for me though.